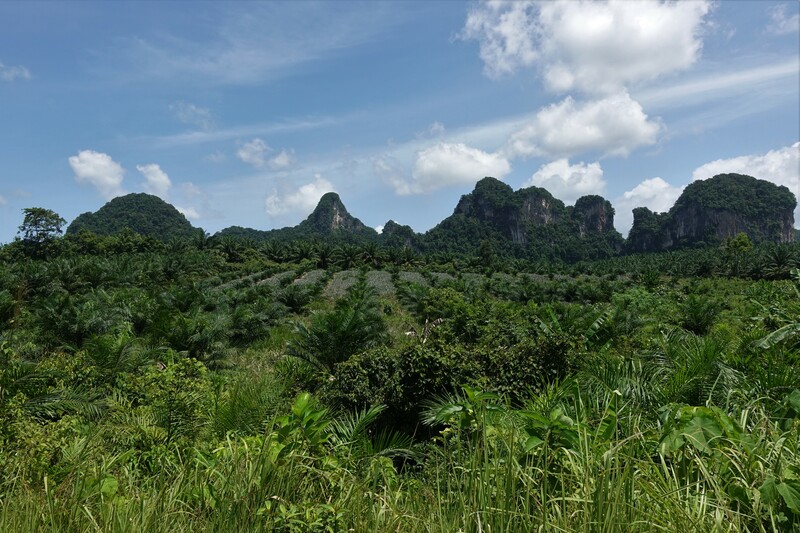 The geography of Thailand makes things easy when coming from Singapore: there is only one direction possible – going north! 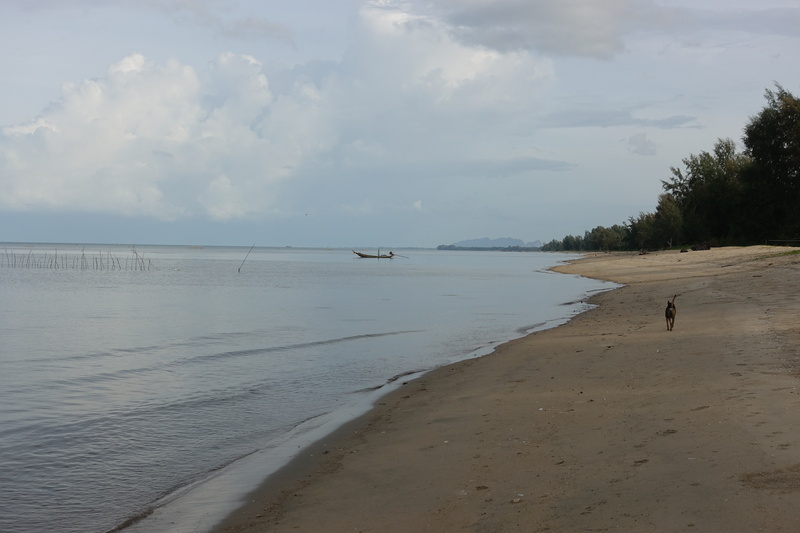 There is yet two routes possible, the west coast on the Andaman sea (towards the Indian ocean, Myanmar and Sumatra) or the east coast (towards the Gulf of Thailand, Cambodia and Vietnam). The west route goes through a few national parks, it’s not the most direct way (thus no trucks or long-distance traffic) and seemed like the first good route, the small drawback in June are the weather statistics – apparently on average 700mm and 25 days of rain in a month which is about the same as Toulouse/Detroit/Augsburg in a year (we have checked and all three are similar)! 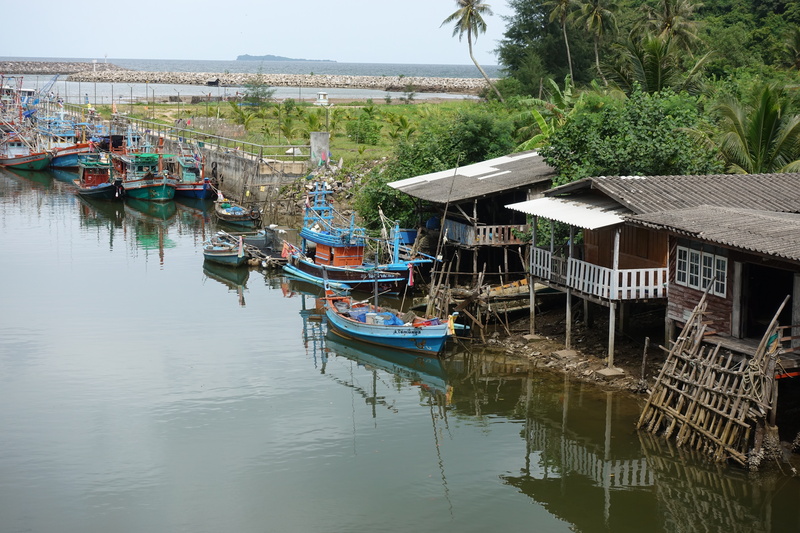 Searching a bit online, we also noticed that there are heaps of small roads on the coast, parallel to the trans-Asian highway (some sort of discontinuous highway running from Singapore to Iran). 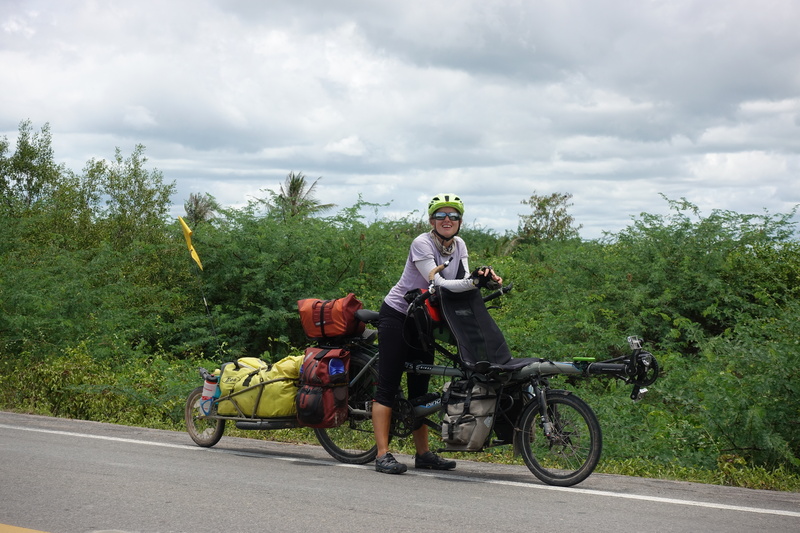 That will be our route all the way up to Bangkok, 1000km north. 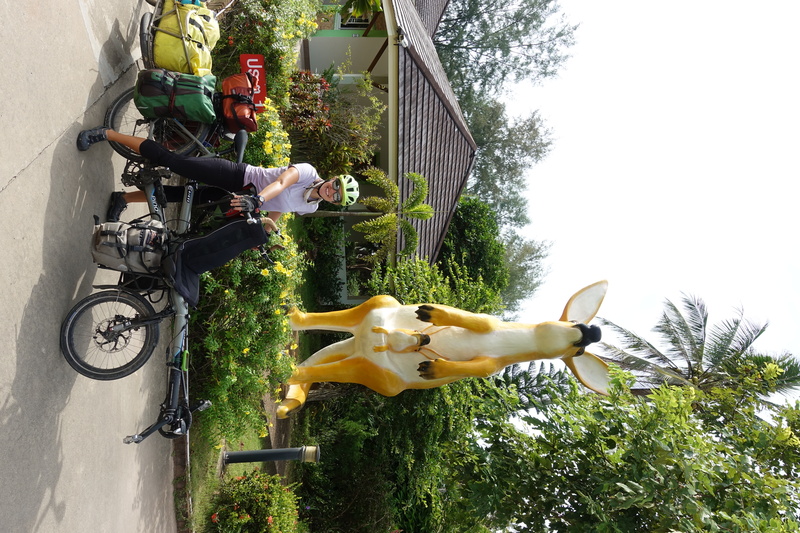 We left Krabi on a warm morning and started cycling up the highway until we found our turn off towards Surat Thani on the east coast. 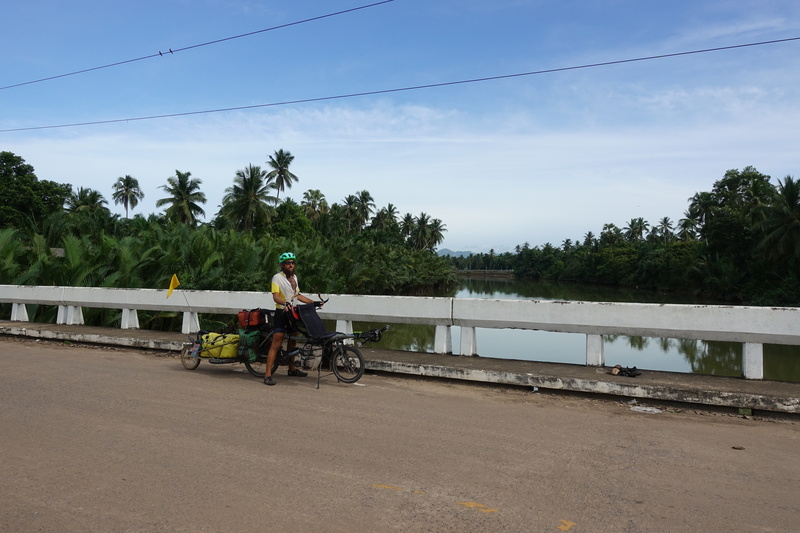 Compared to the highway 4, this four-lane divided highway had barely any traffic, maybe an average of one car every minute, so Cédric and I enjoyed the scenery to ourselves. 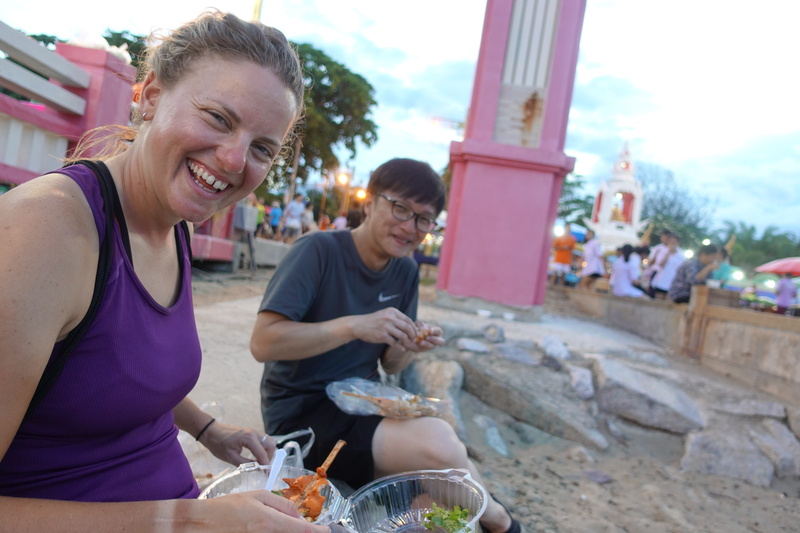 However, little traffic also meant little opportunity for food, drinks, and shade (it was particularly hot this day), so we stopped at the few shops we found along the way. 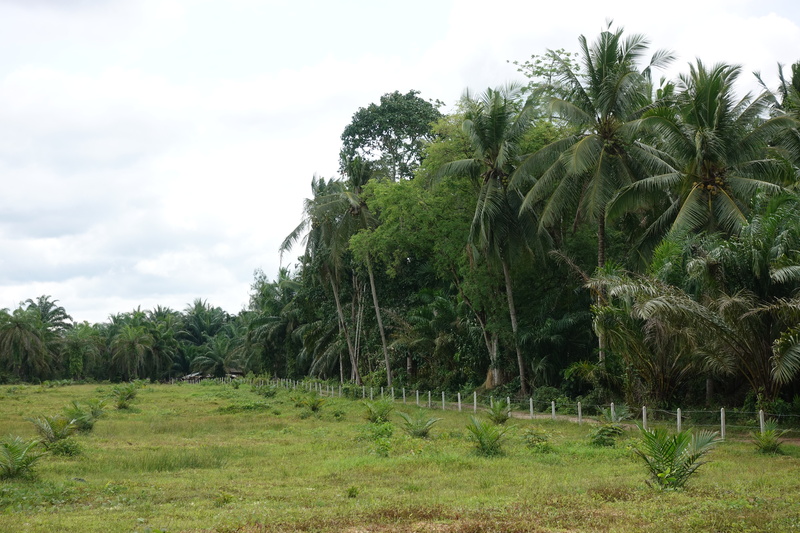 Our evening was spent at a resort in a village on the side of the highway. 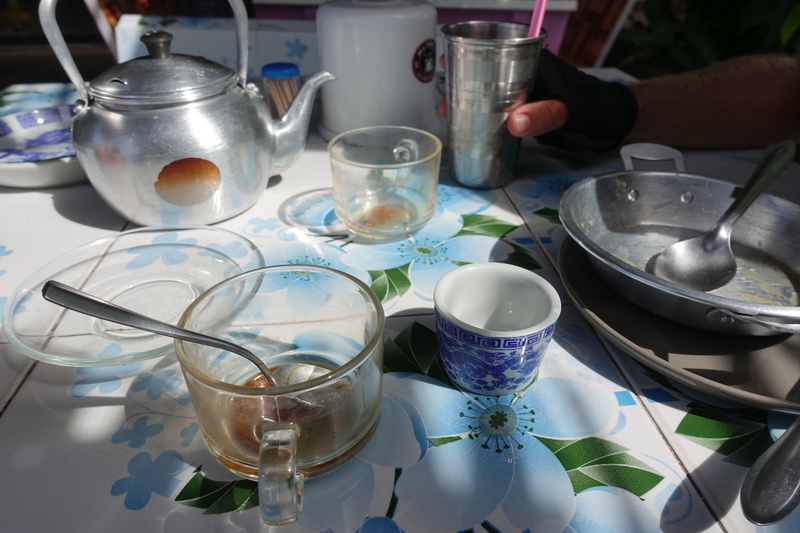 The hotel room mess – but an absolute luxury for a fare at a fraction of a campground in New-Zealand! 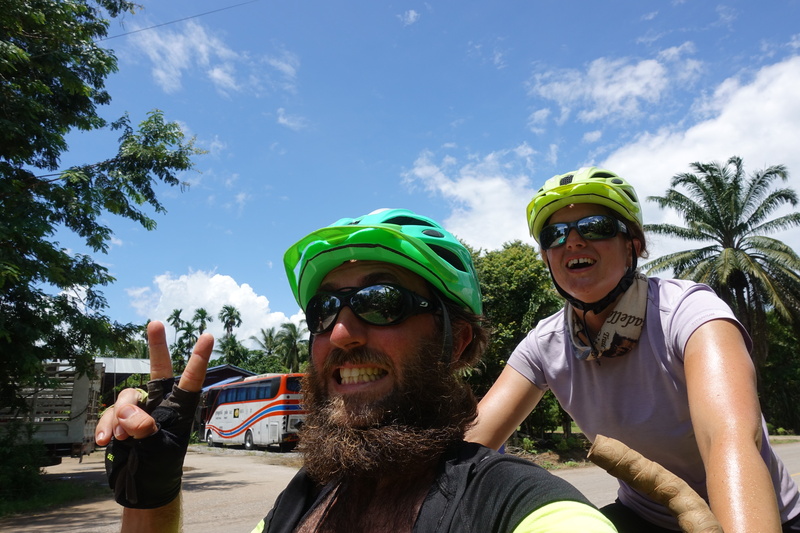 Most relaxing cyclo-touring trip ever. 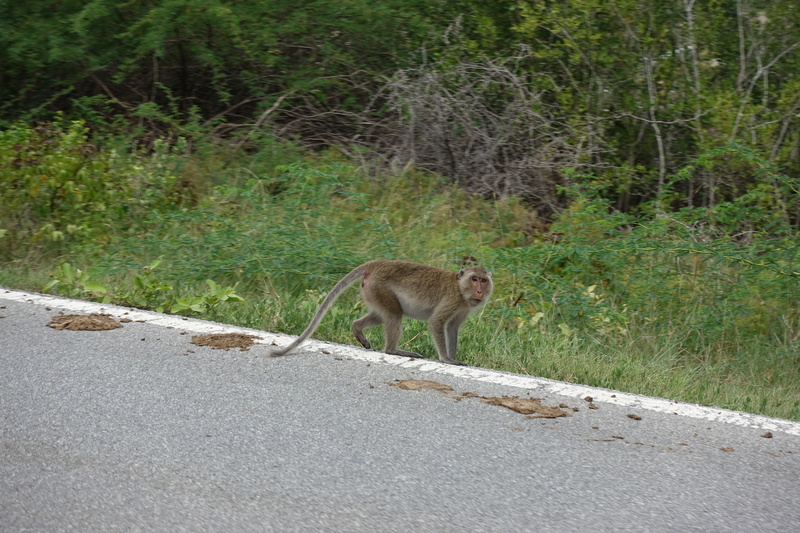 Main source of traffic on quaternary or quinary roads… but most of the time still with a good asphalt! 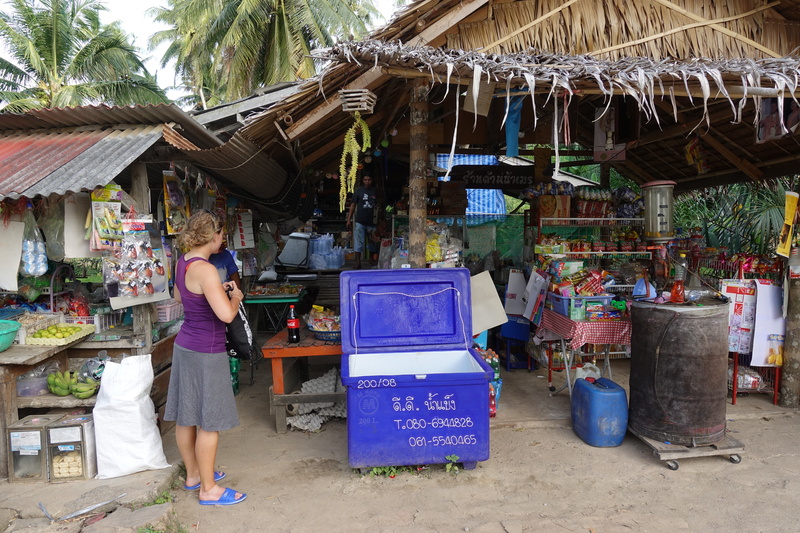 Lunch break – only shop in over 25km, so not many options: we were not super confident eating pork skewers waiting on the counter (it tasted like polyurethane but we didn’t get sick), it was also the spot of a local sorcerer-guru-magic amulets retailer (those amulets are a serious thing in Thailand…), and of suspiciously-not-doing-anything-policemen (who also somehow seem to rarely pay when they go in a restaurant!?). 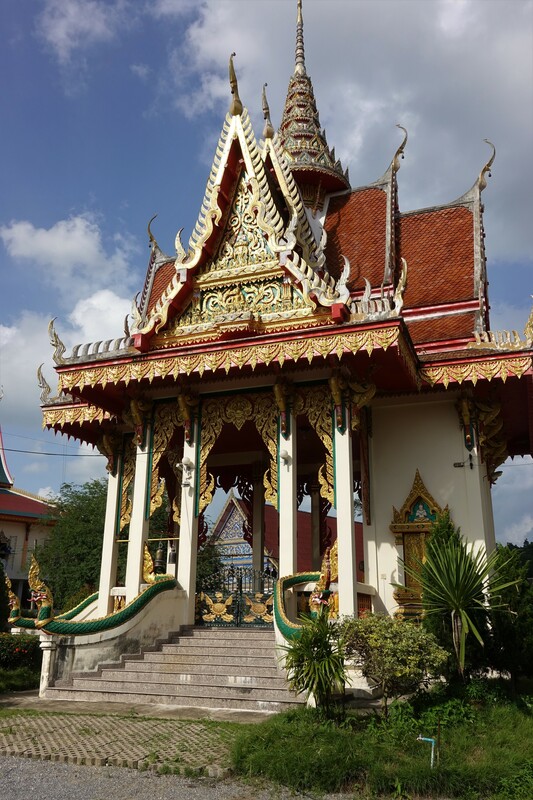 A random temple in Thailand. 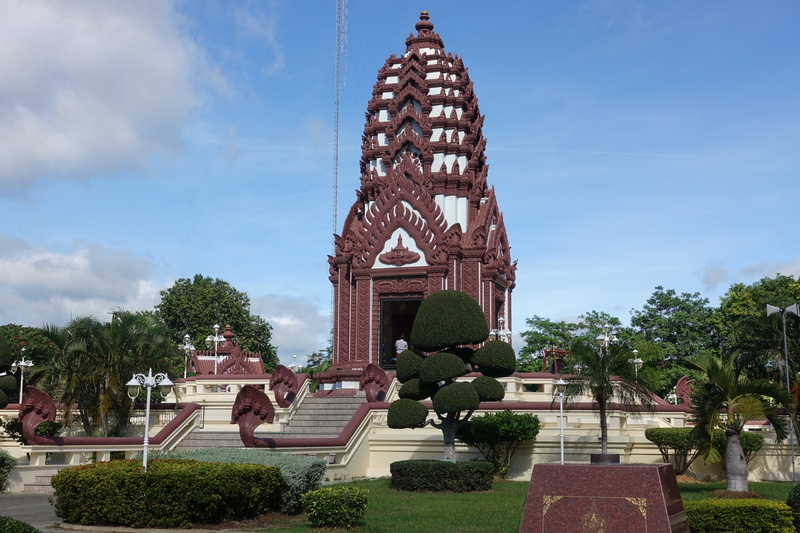 There are so many temples everywhere, with so much decoration that we sometimes got disappointed when visiting the ”recommended” touristic temples afterwards. 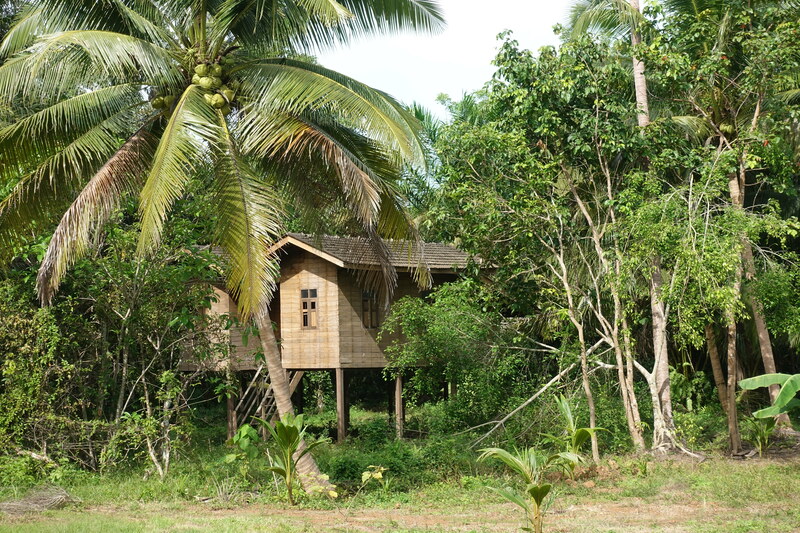 Temples in the country are not listed anywhere, just found riding. 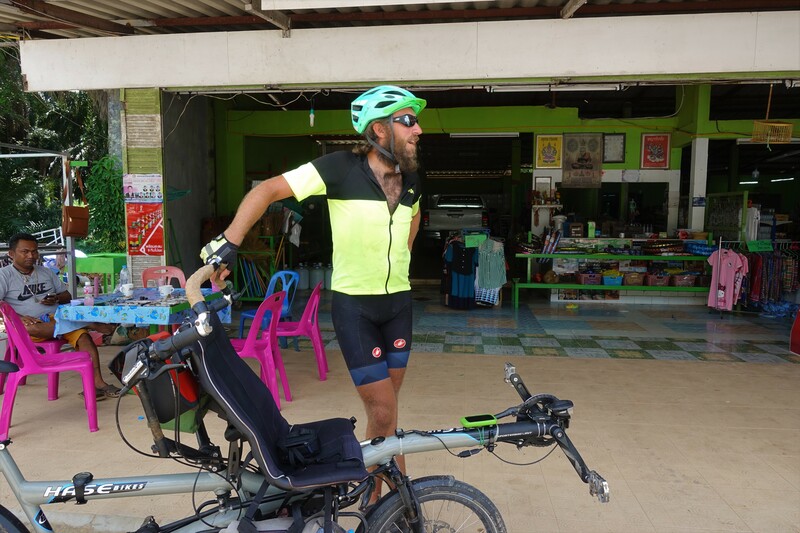 The next morning, Cédric and I set off towards Surat Thani and continued following the highway, stopping a few times for breakfast and second breakfast. 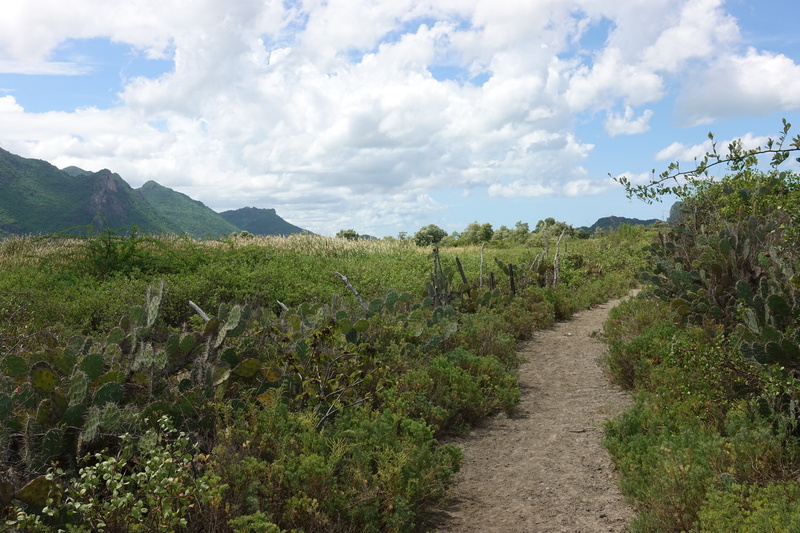 This day also brought a few rain showers, so we needed to duck into a few shops to let the showers pass. 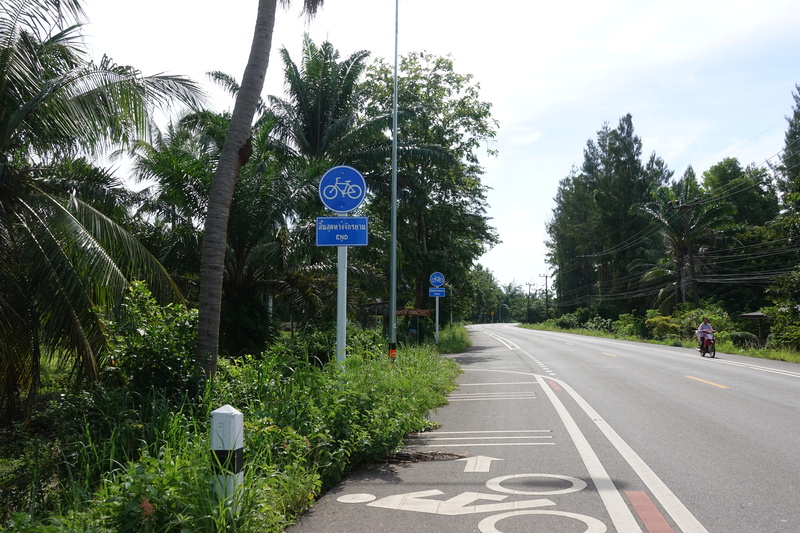 The afternoon was spent on uneventful highways – a necessity when cycling towards the coast. 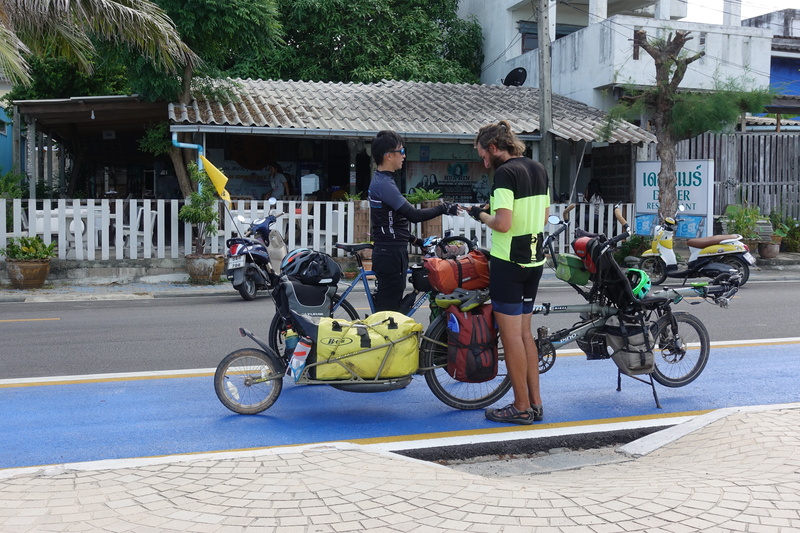 We managed to get to our hotel just before a big storm came (Cassie was watching the dark clouds approach in the mirror and telling Cédric to push like crazy – we rode the last 5km across a town at 30km/h) and enjoy sea-food at a restaurant getting its supplies directly from fishermen unloading on the beach. 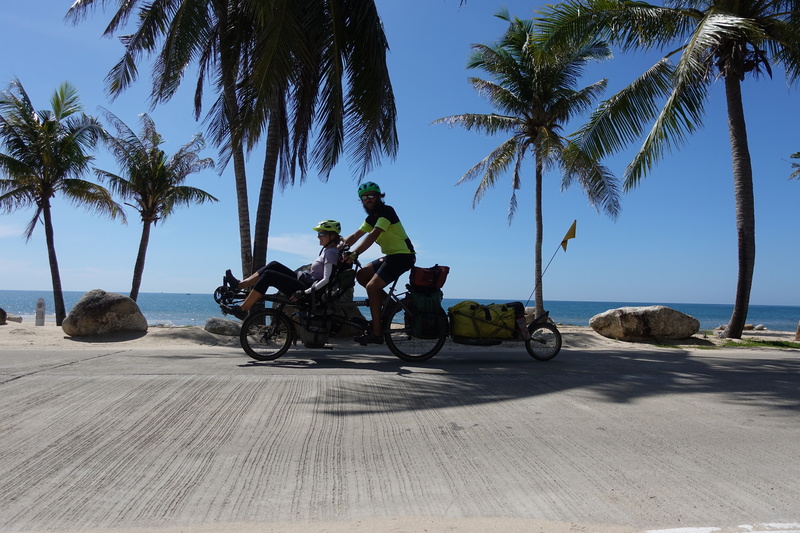 The next day, we cycled down roads that were located somewhere between the highway and the coast. 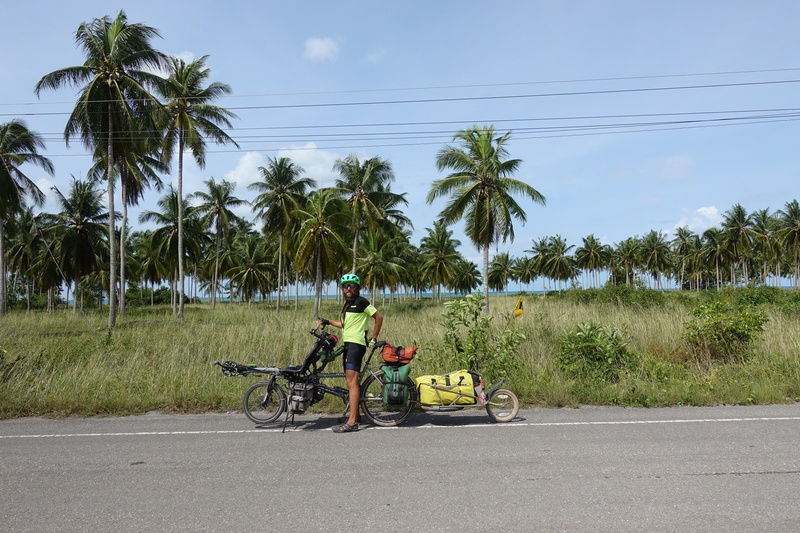 We started on main roads, but our Garmin took us on increasingly smaller roads through palm tree plantations. 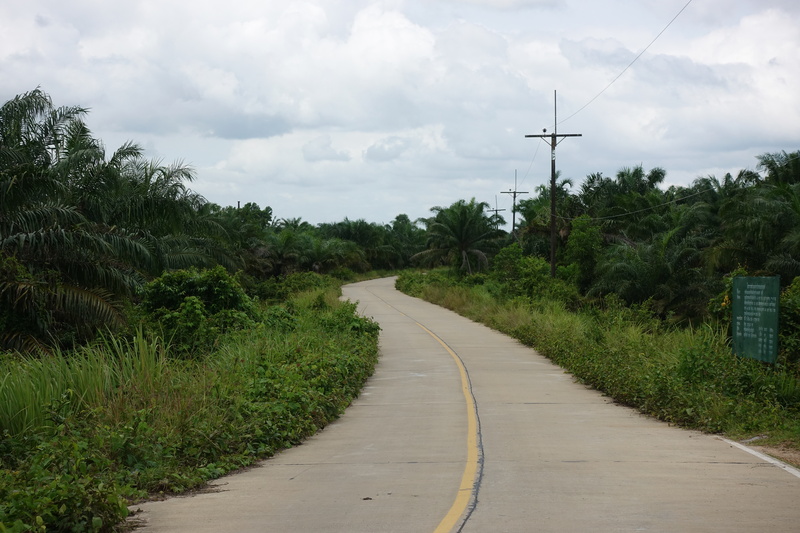 It amazed us that these tertiary and quaternary roads both existed on our maps and were relatively well maintained. 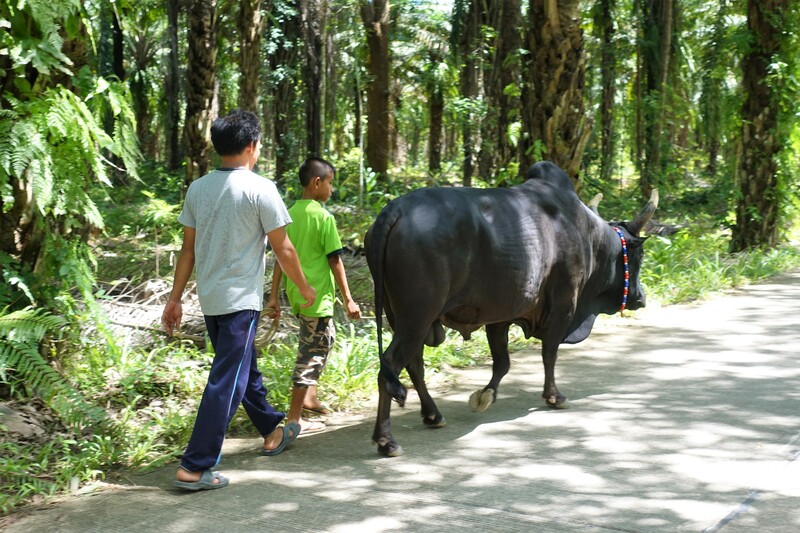 There is still asphalt on most of the roads, very few potholes, almost no car traffic (it’s mostly motorbikes, tractors, people walking behind their cow, etc.). 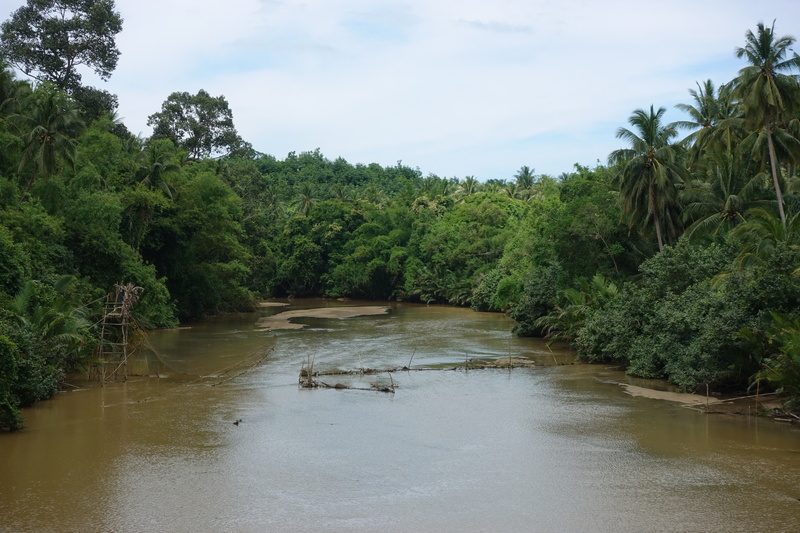 I also think it bemused the local palm farmers to see us way off the beaten track, and probably wondering what we were looking for there: simple answer – a quiet ride! 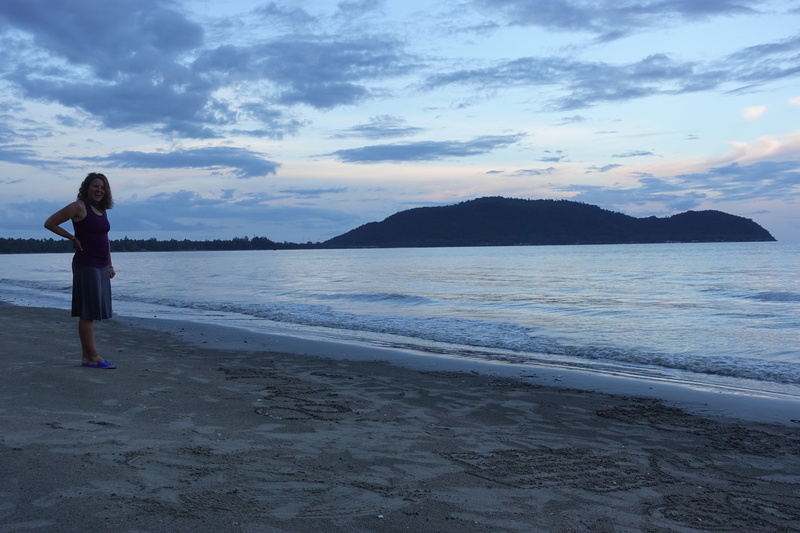 We ended our day at a hotel on the coast – we swam in the pool and walked along a deserted beach and around the small village before dark. 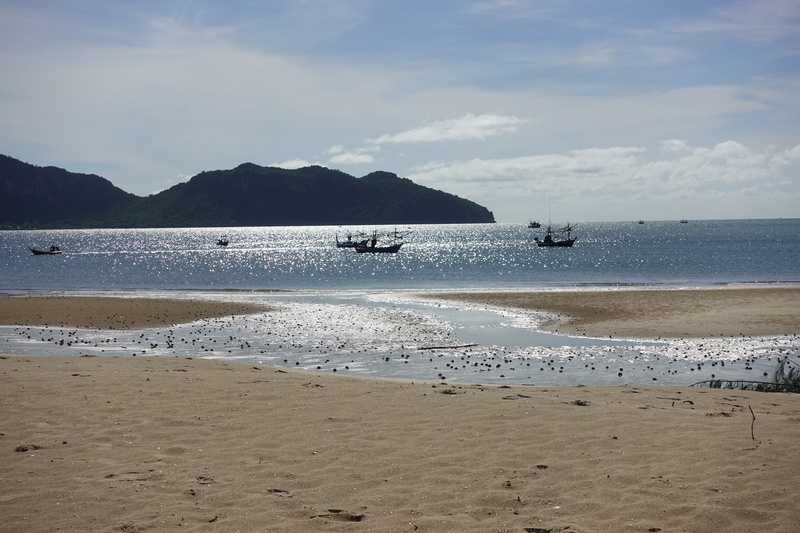 This whole stretch of coast felt completely forgotten from tourism although Krabi/Phuket and Hua-Hin are only a few hours drive respectively in the south and the north. 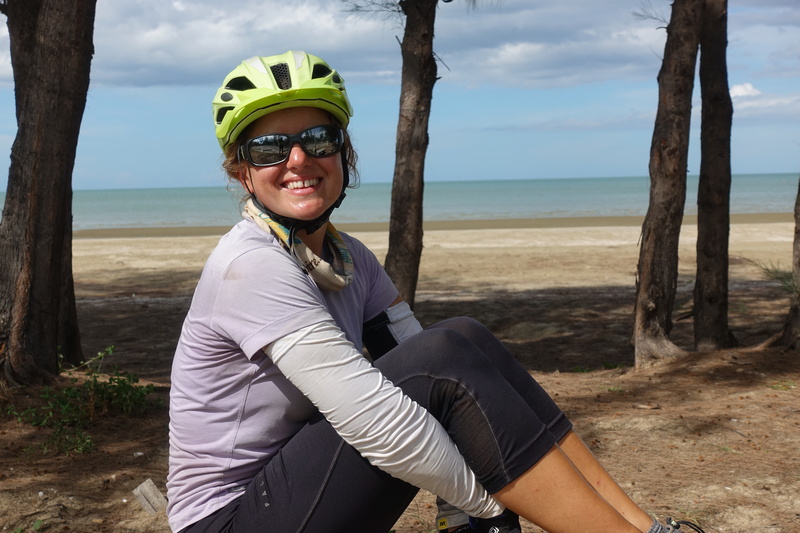 The coastal scenery was fantastic all along, cycling from a bay to the next one, some hotels that offer much cheaper prices and a much more relaxed atmosphere. 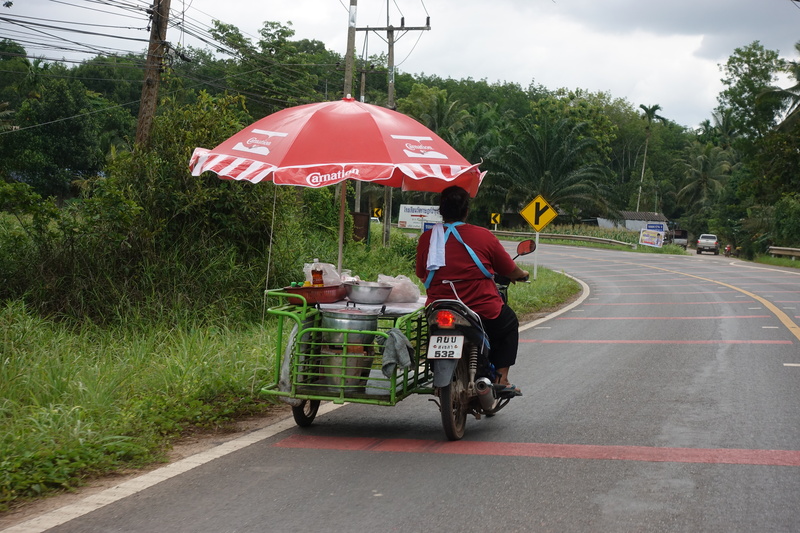 A food cart – the other slow-moving vehicles on the roads besides us. 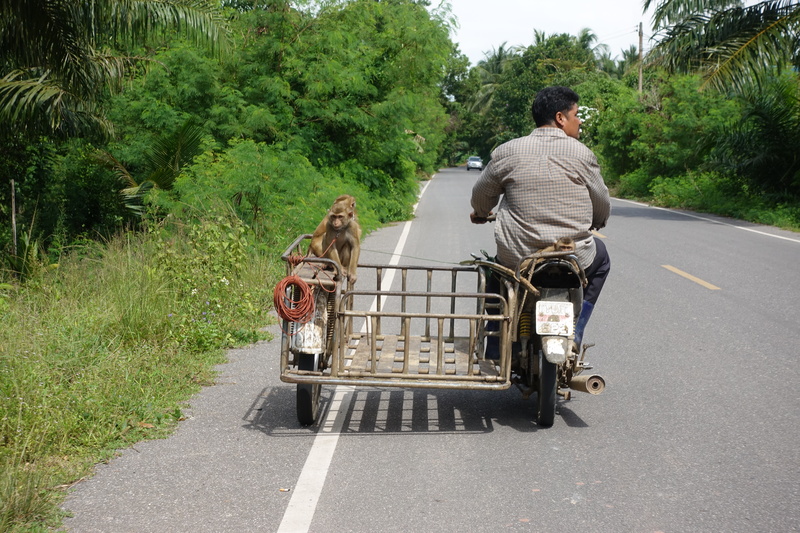 Driving in Thailand on small roads is very chilled – we often have to pass motorbikes, trucks, etc. 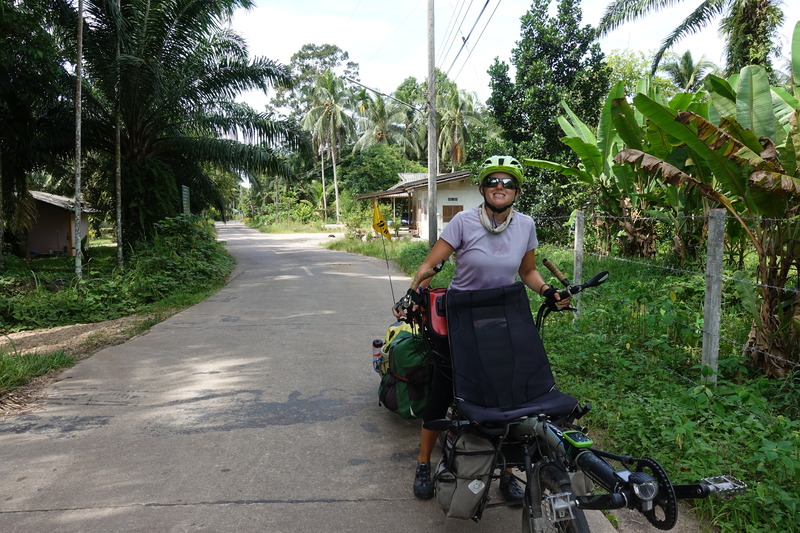 As we went north over the next few days, we continued cycling through various palm, coconut, banana, and pineapple fields, as we tried to follow a straight route up along the coast. 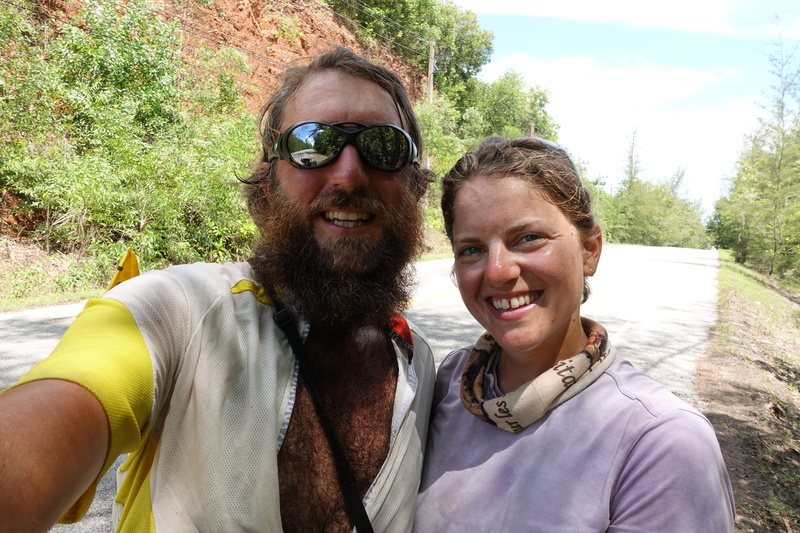 A few times, I needed to ask Cédric if we were on the correct path, because some roads seemed impossibly small and unmarked. 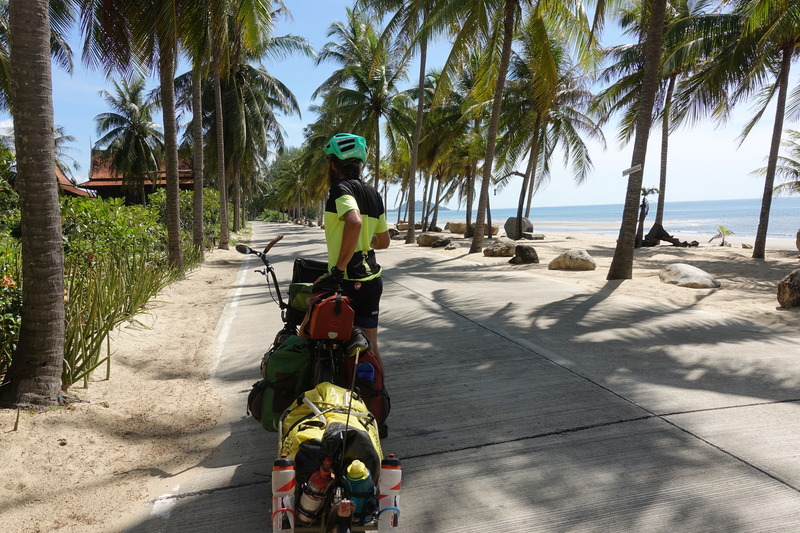 That is definitely a great advantage of using a GPS (and a touring bike): it provides us some great suggestions of routes that we would have never ever thought of taking, and no matter how the pavement will be, we will still always manage to go through it! 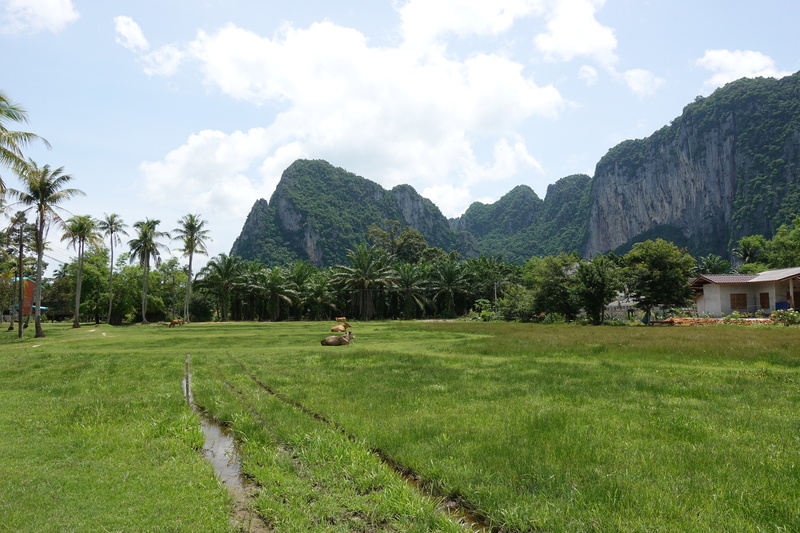 Along these roads we also got to experience the other, more feral, side of “man’s best friend,” as dogs lunged at us from seemingly every property (we’ll dedicate a full blog post to the dogs). 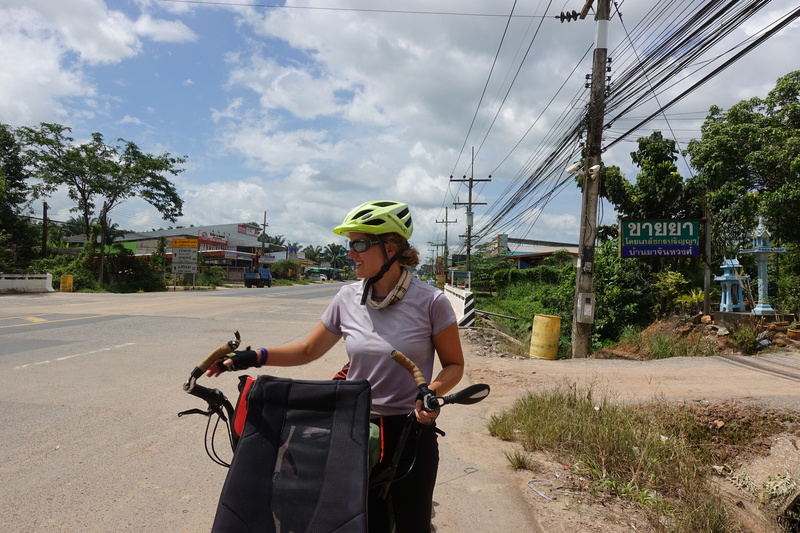 We only needed to join the highway at a few separate times for a few kilometers to extend our Thailand stay at an immigration office on the highway and because there weren’t any alternative options. 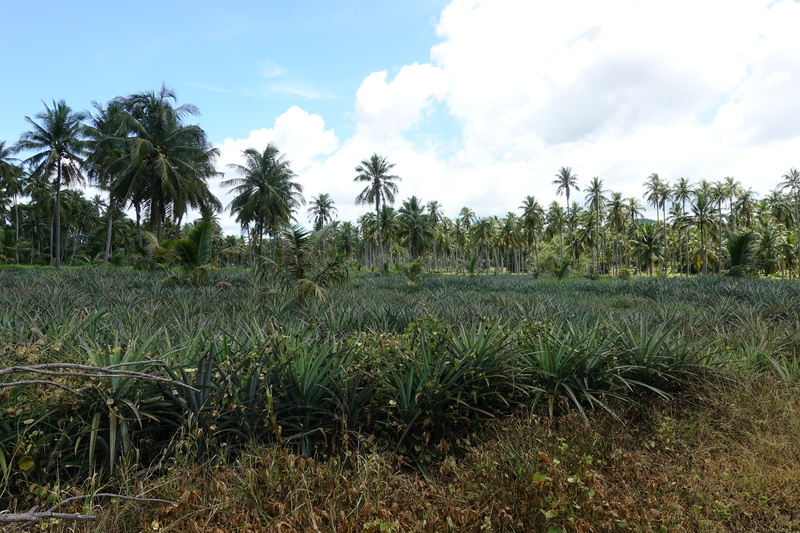 However, we enjoyed most of the route somewhere between the tropical crops and beach. 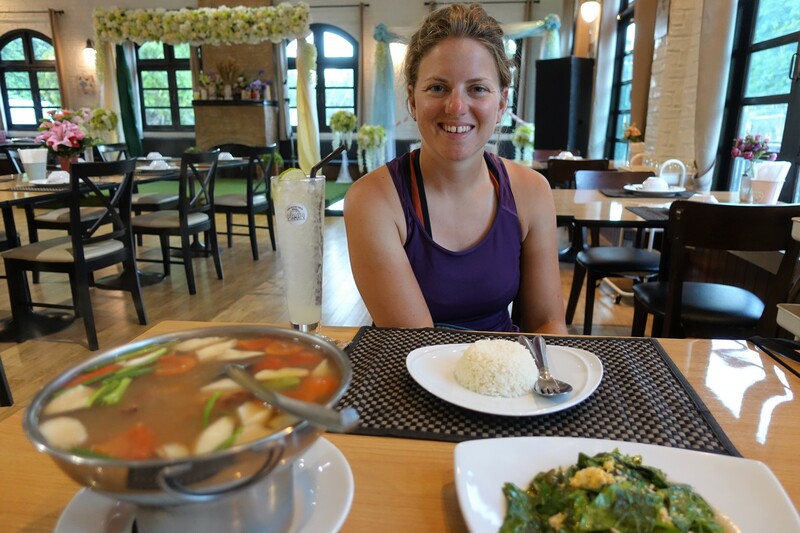 We managed to legally extend our stay in Thailand for another month (pretty easy, it took 1h and we had absolutely nothing ready for the extension when getting in)! 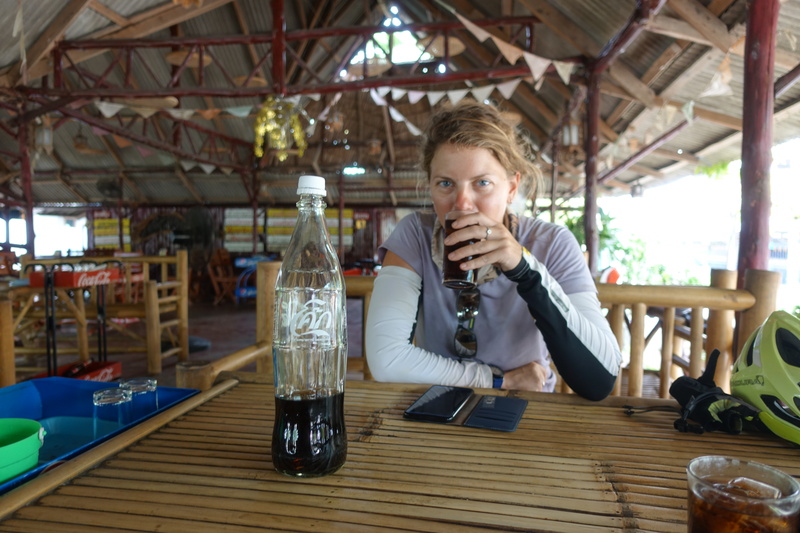 No, we do not just drink coke! 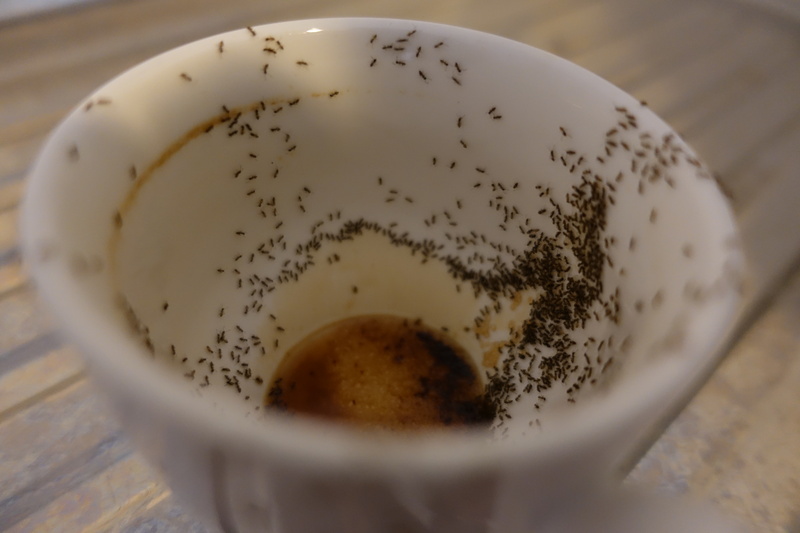 This is what happens when you leave a coffee cup (or any food) on the ground for approx 20 minutes (really). They’ll find you. 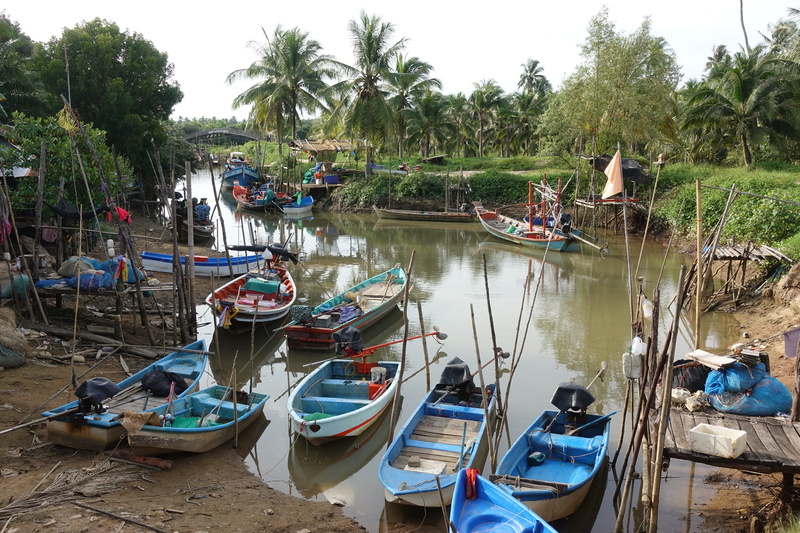 We also do not understand why Thailand has so many electric wires everywhere! 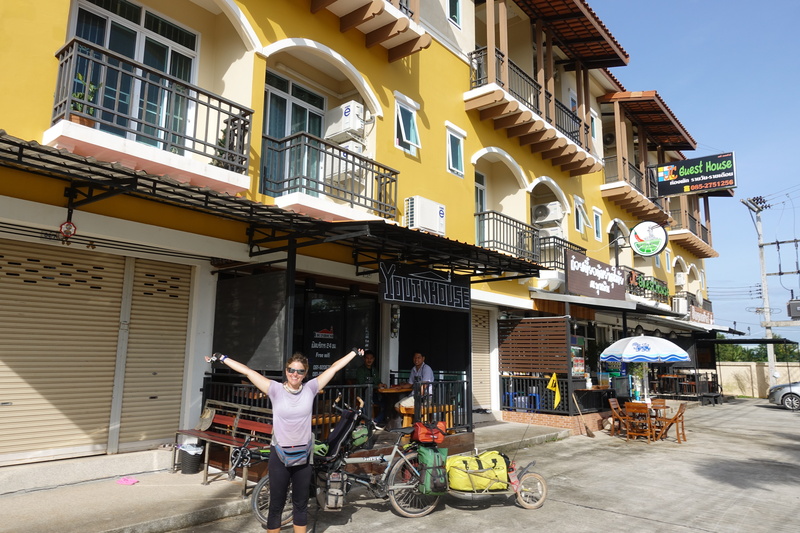 One day, we met Kayo, another cyclist from Hong Kong at a 7-eleven (they’re ubiquitous here, almost at every street corner if the town is large enough) and we rode together for the remaining day towards Prachuap Khiri Khan. 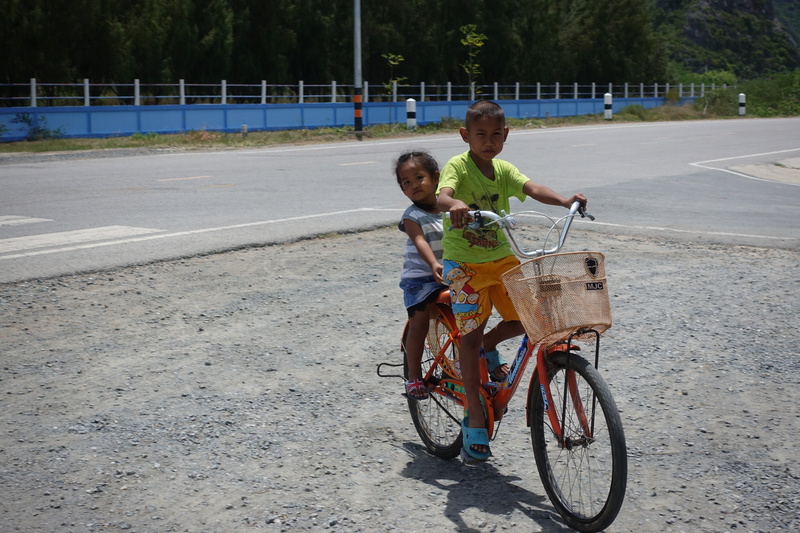 The route took us along the coast and through Ao Manao, an oddly pristine beach town that also serves as an Air Force base and required us to show our passports when entering. 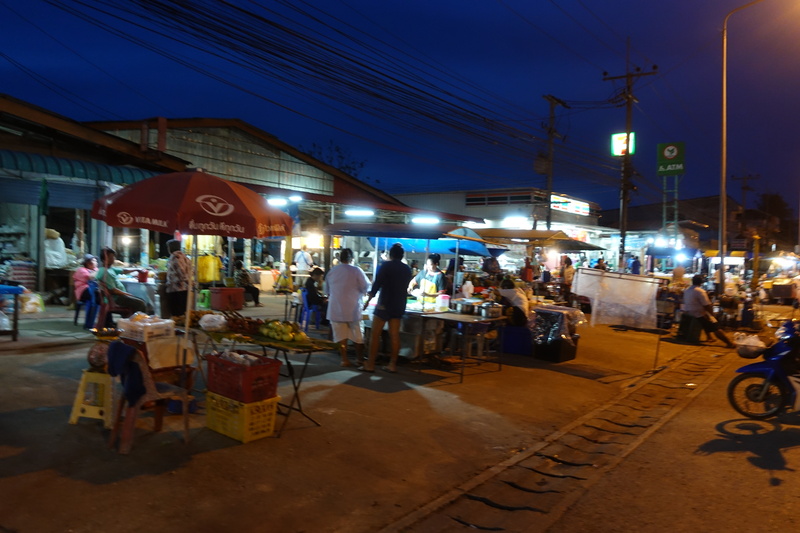 That evening, we avoided yet another quick and strong thunderstorm and roamed the weekend street market looking for treats. 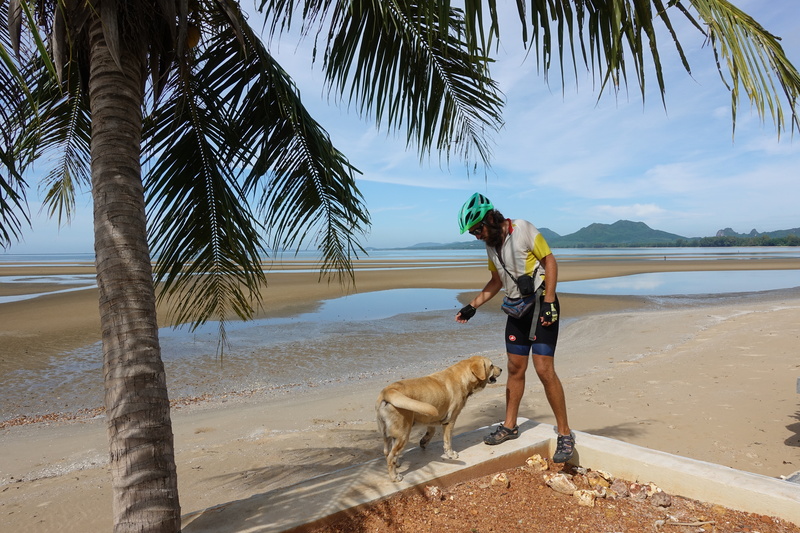 The next morning, after cycling our first few kilometers, we said goodbye to the fellow cyclist as Cédric and I continued cycling along the coast and winding through Khao Sam Roi Yot National Park, where we stopped to watch the wild monkeys and check out some temples. 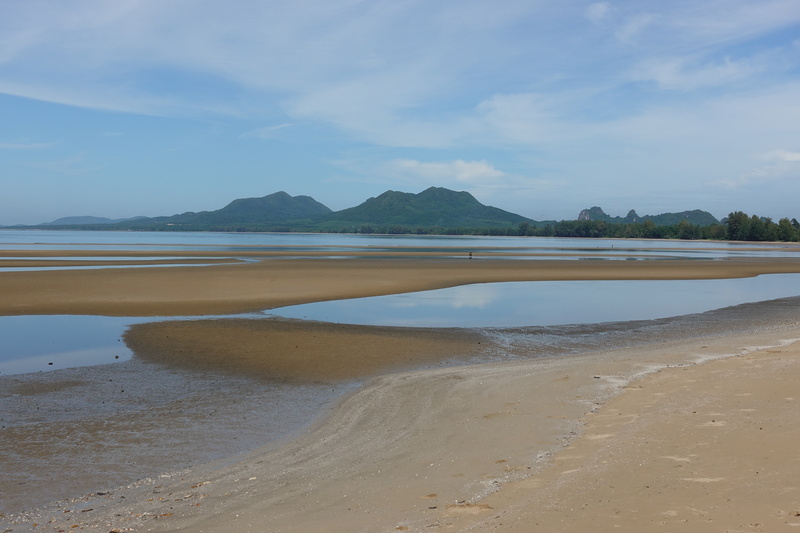 Our day ended up the coast in Pran-Buri, where a German expat and cycle tour operator saw us looking at our phones and taking pictures of the beach – he asked where we were staying and Cédric told him that we hadn’t booked anything yet, so an English friend of his offered a room in her empty guesthouse. He asked us if we needed a swimming pool, but we replied that the ocean was large enough for us, so he still brought us to the same place with a pool (but couldn’t charge us extra for that luxury). Yet again, we were the only people at the hotel that night, and thus once we got there, we quickly cooled off with a naked jump in the pool (it was way too tempting after a long day in the sun to change and delay that by a few more minutes!) 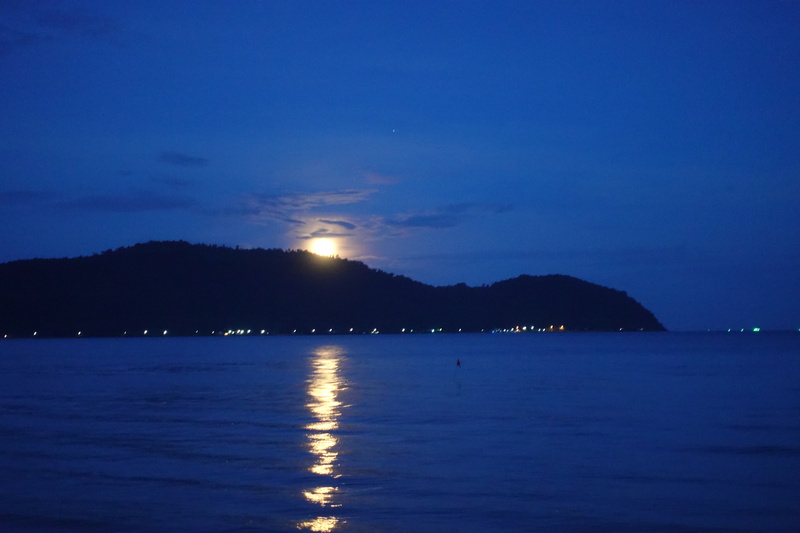 and went out to find dinner before dusk.